Saturday, Mar. 17, 1888 As mild still, but air filled with fog or mist most of day. About as usual with our folks, & busy as ever, tho' Rosa was at W.C.T.U. meeting, P.M. Xe. O. Dayton returned with Geo - in eve, to spend night. After good night's rest tho't self better again, & busy at "usual chores" with knitting, but while at supper had "half unconsciousness" so left table awhile. 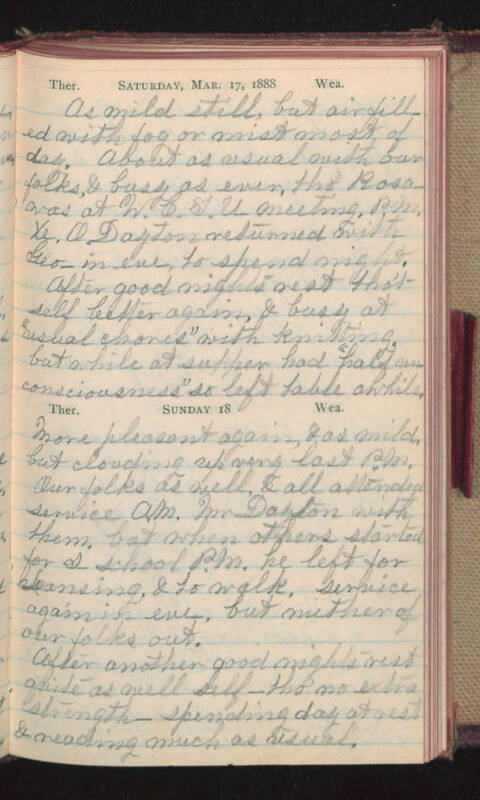 Sunday 18 More pleasant again, & as mild but clouding up very last P.M. Our folks as well, & all attending service A.M. Mr. Dayton with them, but when others started for s-school P.M. he left for (Lansing? ), & to walk, service again in eve, but neither of our folks out. After another good nights rest quite as well self - tho' no extra strength - spending day at rest & reading much as usual.